At the recent Senior Awards Ceremony, SEED Chairman, Bob Draffin, presented SEED’s fifth annual scholarship to this year’s winner, Phillip Tubiolo. 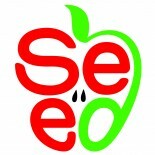 Phil wrote an excellent essay in which he suggested ways that SEED could help promote more scientific enrichment programs and allow students to apply directly for SEED Funding Projects . The BBP SEED Foundation wishes Phil the best of luck, as he pursues a major in biomedical engineering at Stony Brook University. This entry was posted on July 6, 2017 by SEED Info in Uncategorized.